Last year, Americans spent over $10 billion on plastic surgery (white). The federal budget for NASA’s space operations was $3.5 billion (red). Readers can find Mendes entries here. 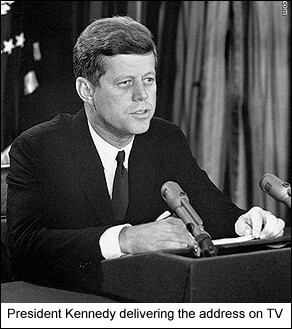 As we stand to attention and salute, we might recall that it was on this date in 1962 that President John F. Kennedy took to television to report to the nation that Soviet nuclear missiles had been stationed in Cuba, and that in response, the U.S. was launching a naval blockade– and the Cuban Missile Crisis began. Fifty years later, with the benefit of recently-declassified documents, it’s clear that the crisis was even more dangerous than it felt at the time… and as Ploughshares notes, its effects are with us still.